"Picking up a plastic recorder at the local music store is a memory that most elementary school musicians and their parents have firmly imprinted in their minds." notes Sean P. Thomas. The ensuing rendition of “Hot Cross Buns” is a memory that both parties would likely want to forget. At select elementary schools in Calaveras County, elementary school music teacher Robert Wise is giving students a less shrill entry into the world of music by offering a new instrument to rookie musicians to test their musical chops. “It’s music literacy, the ukulele way,” Wise said. Wise has for some time shared his love for the ukulele with fourthgraders in the Calaveras Unified School District, with Jenny Lind Elementary School just the latest campus to offer the class. Students meet twice a week with Wise, who bounces around from campus to campus in the district to teach the instrument as strument as well as other musical instruments. 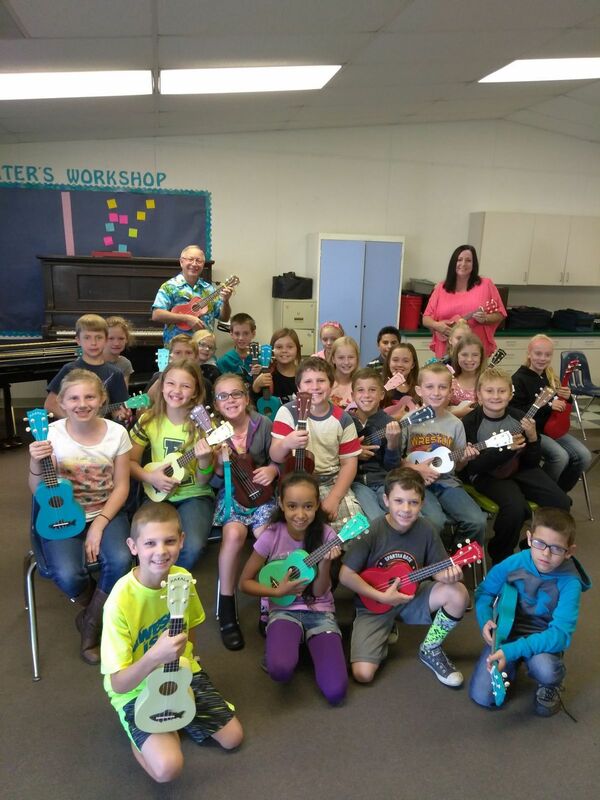 A quick peek into one of Wise’s classes reveals a sea of multicolored ukuleles gripped eagerly by a score of students with beaming faces. At one time considered simply a novel curiosity from Hawaii, the ukulele is striking a chord with the students. The small stringed instrument gives students the opportunity to learn fret placement, chords, and strumming techniques, most of which, Wise said, can directly translate to larger stringed instruments like guitars, basses, or violins. Siblings Jorn and Gillian Baureson are two of the 24 students in the Jenny Lind class. The pair has taken a particularly strong liking to the instrument, going out of their way to grab additional instructional in and out of the classroom. “It’s much easier once you get the frets down,” he added. Jorn and Gillian, who hope to move on to play the saxophone and flute in the future, currently get all of the learning they can get out of Wise by attending early lessons where they pick up blues style chord progressions and more advanced instructions.